Viessmann Vitodens 100-W is the group of modern gas-powered condensing boilers with the indirect-fired design for the high efficient space heating and on-demand domestic hot water production. Vitodens 100-W boilers offer an outstanding performance and ultra-efficiency of over 95% that guarantees great savings, especially when combined with the solar heating system. The Vitodens 100-W comes with the compact and small design that measures 14”x16”x28.5” for an easy installation on the wall of the smaller home, cottage, apartment and places with the limited space. There are two models from Viessmann 100-W series; WB1B 26 and WB1B 35, both models factory set to use natural gas or propane (LP), and due to the automatic adjustment, manual conversion is not needed. The heating capacity is from 9.9 to 24.3 kW for smaller units and from 9.9 to 31.6 kW for WB1B 35 units, both providing high efficiency of 95.2%. The condensing technology allows Vitodens 100-W to work with the very low water and exhaust flue temperatures, which results in significant reduction of heating costs and greenhouse emission. The 100-W boilers have zero clearance to combustibles while providing great flexibility in venting. The Vitodens 100-W uses the direct vent system with the sealed combustion so the inner surrounding air is untouched. The vent pipe can run up to 200 feet and utilize a variety of cheaper materials such as PPS, CPVC... The multiple venting options include horizontal, vertical and hybrid configuration with the coaxial or double-pipe system. All these features allow the installation in almost every part of your home, including the living area and homes with the limited space. The Viessmann Vitodens 100-W utilizes the modulating MatriX cylinder burner and lnox-Radial heat exchanger, which allows the heater to work with the low NOx gases while its stainless steel construction makes it run for a long time. 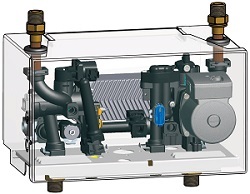 The quality material, advanced design and great features, such as the “self-cleaning” heat exchanger are what make these units reliable and with the maximized performance. The burner is part of the forced-draft system where the blower and other elements bring the ideal air/gas mixture for optimal gas combustion. The built-in control board allows easy problem solving, thanks to the diagnostic system, and temperature control when connected to the inner thermostat or outdoor temperature sensor. The built-in automatic frost protection keeps the unit safe during winter time and extended absence when the temperature reaches 41F. The boiler water temperature can be adjusted from 86 F to 176 F for space heating and from 86 F to 172 F for domestic hot water, while the high limit temperature is 210 F when the unit shuts off for safety. The control unit is easy to use; it utilizes the large LCD display, selector dials for temperature change and service settings, pressure gage, burner fault display, burner temperature sensor, fault reset and high limit sensor. Vitodens-100 models are mainly used for space heating, but by adding the CombiPlus Kit, models are converted to water heaters providing hot water with the maximum hot water flow of 6.2 GPM (at 35 F temperature rise), on demand, in continuous and endless supply. The Kit installs separately with the minimum changes on the boiler - just plumbing and electric connections. The CombiPlus Kit is usually installed underneath the boiler, and it includes the 3-speed pump and diverting valve, pressure bypass valve, water hammer arrestor, and another stainless steel heat exchanger; all working for heating domestic water very quietly, for great comfort and long showers. These units can also be used in conjunction with the stand-alone storage water tanks. In residential applications, the Viessmann water boiler has a limited lifetime warranty.